Dan Astbury, Red Squirrel Tree Surgery: We provide a range of tree surgery services across Chester, North Wales and surrounding areas. Fully qualified and insured, we offer reliable, professional tree surgery services and tree or shrub management advice. Maintaining your trees and shrubs is vital to their health and will reduce problems for your property and garden or land boundaries. Fallen or unsafe trees affected by storm damage, or other emergency situations, can present a real danger to property and to life. 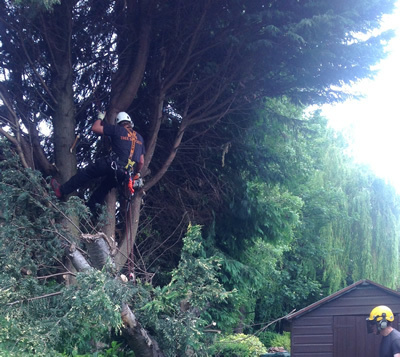 We undertake emergency tree work with safety in mind. We may be busy, but will call you back as soon as we can. Should your trees and shrubs become diseased or threaten the integrity of your property, we can help you resolve, or lessen, the impact of existing or potential issues. Maintaining your trees and shrubs is vital to their health and will reduce problems for your property and garden, or land boundaries. We provide tree surgery services across Chester, North Wales and immediate surrounding areas, Cheshire. To request a site visit for your domestic or commercial tree surgery and tree work advice needs, just complete the form and I’ll call you back to arrange your site visit appointment. Dan Astbury, Red Squirrel Tree Surgeon. Please allow 12-24 hours as I'm likely to be out (up a tree) right now.